We are having a hard time choosing our favorite trend from the top 5 latest handbag styles for spring! The great news is that there is a variety of fun new looks and if one doesn’t suit your style, another one surely will. We are seeing the soon-to-be-iconic bucket bag on the arms of fashionistas everywhere and it’s destined to be a classic. The boho and ’70s-inspired bags with their tassels, fringes and vintage leather are on our must-have list for the weekend. Mini bags are perfect for luncheons, events and nights out (just make sure your phone fits!). And everyone needs a beautiful tote bag, whether it’s for work, yoga or vacation. 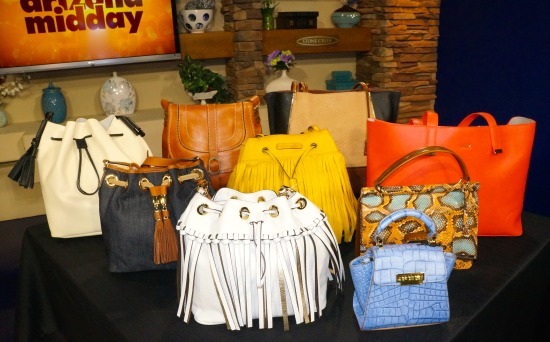 Today on NBC Channel 12’s Arizona Midday, MSL’s Angela Keller shows us the top 5 trends and what’s haute this spring. For an everyday bag that still looks fun, I like labellacouture.com. Great quality, lots of room & individual style!